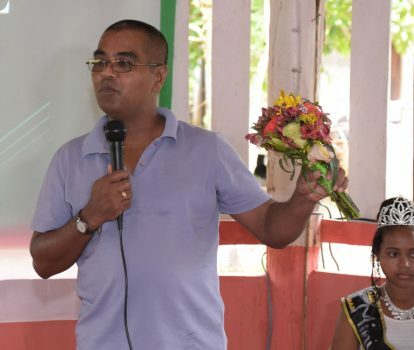 Indigenous Guyanese were encouraged to become advocates for social cohesion on Saturday by the Reigning Miss Indigenous Heritage Queen, SherryAnna Balkaran. The Ministry of the Presidency said in a release that she was speaking at the Mahdia Social Cohesion Sensitisation Session organised by the Ministry of Social Cohesion. It was held at the Campbelltown Benab in Potaro-Siparuni (Region Eight). “As persons residing in Indigenous communities, villages, and even towns, like Mahdia… we are often scorned and discriminated [against], and looked upon as persons from a lower class and sometimes we ourselves have discriminated [against] others. But I would like to implore you to be advocates… [and to] be as socially cohesive as [you] possibly can… If we are united and we stand strong together we can counter, curb, and maybe annihilate problems that affect us all,” she told those gathered. The session was hosted by the Coordinator for the Ministry of Social Cohesion, Sharon Patterson and was aimed at providing the residents of Mahdia and surrounding areas with an outline of the role of the Ministry. When the floor was opened to attendees, Joycelyn Ambrose identified the education gap between some parents and their children, who are currently in school as a problem that needs to be addressed in the Region. “We need to educate the parents, especially the mothers… We [can] form a community [to] teach. Even if you [only] know how to sew, knit, stitch… We can [learn to] read, write, count, [and] spell within the same [programme],” she said, according to the release. Former Registration Clerk at the Guyana Elections Commission, Emanuell Gilkes commended the Ministry for their work nationwide. “It is necessary,” he said, “generally speaking, we are divided. It won’t be obvious at first glance, but subliminally you can see that certain things… are not good,” he said. Gilkes also asked the Ministry to target young men in the area who don’t often come in contact with good role models. “I think a more cohesive group of men would [make things] better… We have no real guidance… With [the support of] a Ministry that looks into our cooperation and peaceful existence, I don’t think there is more [we] can ask for,” he said.